As described in my previous article, OpenOffice.org is a free office suite (although you can buy a copy of OpenOffice.org if you prefer). I’ve found it very easy to create eBooks using OpenOffice.org - far easier than it is us the far more expensive Microsoft Office . In the last article, I wrote about Writer, the word processor in OpenOffice.org, in this one, I’ll talk about Impress, the presentation package in OpenOffice.org. Before we start with the tutorial, let me just mention one of the biggest advantages of using Impress (in OpenOffice.org) as opposed to Microsoft PowerPoint (in Microsoft Office ): when you convert to HTML in Impress - you can turn off the use of frames. 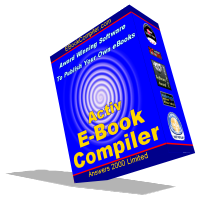 This is a huge advantage, because it means that Activ E-Book Compiler’s Search and Table of Contents functions, just work, absolutely perfectly, without any fiddling around. This is such a big advantage that it means if you have a PowerPoint presentation, and want high-quality quick version into an eBook, possibly the best way to do it is to open the presentation in Impress, and convert from there (and yes Impress can read PowerPoint files). As with the last article, before the tutorial I need to display a quick legal notice, which OpenOffice.org’s marketing people said I should include: OpenOffice.org is a registered trade mark used with permission of the OpenOffice.org Community, http://www.openoffice.org. This page shows you how to create the the content that will go inside (the source files) your E-Book using OpenOffice.org Impress 2.1. The best way to work with Impress is to create your entire presentation as normal, and then convert the entire presentation into HTML (so it can be used as the content for your E-Book). In other words, the whole presentation becames the content of the E-Book. When you do this conversion, the 1 presentation file will be converted into a whole series of files in the your source folder. This conversion process is done from within OpenOffice.org Impress (but don’t worry, we explain the steps below). During the conversion process, Impress will automatically add navigation buttons (etc.) to the pages allowing the user to move through the slides. Provided you follow our instructions below, your pictures and graphics will automatically be saved in the appropriate folder and linked correctly from the other files created. If you do not follow the instructions, then pictures may be saved incorrectly, and when you view the E-Book (or worse one of your customers views the E-Book) they will see missing images in your pages. You can create hyperlinks from your slides to web sites (see instructions below). However, as Impress will link the slides to each other, there is no need to add links between the slides. Please be aware that the OpenOffice.org Impress feature that converts from its own document format to HTML may have some limitations, so it is possible that you may lose some details of your formatting during the conversion process in Impress. As mentioned previously, if you use a web editing program, or a program like OpenOffice.org Word, you would normally want to work directly with your source files. However with Impress it is easier to create your content as a native Impress presentation and then convert the content into sources files later. Create your Impress presentaton exactly as normal. Save the presentation in the normal way (using the Save As menu option), with the Save as type field, set to OpenDocument Presentation (.odp) into the normal location that you use for your OpenOffice.org documents, for example C:\My Documents\. As part of the normal process of creating Impress presentations, you can add hyperlinks to web sites. Place the insertion point (the caret) where the text that will eventually become the hyperlink will go. Click Hyperlink which is on the Insert menu. Make sure Internet is selected on the list of options on the left hand side. In the text field labelled Target, enter the URL of the web page or web site that the hyperlink will lead to. Always include http://, at the beginning of the hyperlink. For example, even though we commonly say www.yahoo.com or yahoo.com, the full URL is really http://www.yahoo.com - and we must always enter the full URL when setting up hyperlinks. In the text field labelled Text enter the text to use for the hyperlink. Click Apply and then Close, and you have now added the hyperlink. Only after your presentation is completed and saved in the normal OpenOffice.org Impress presentation format (known as OpenDocument Presentation (.odP)), should you think about converting your presentation into E-Book source files. You will want to store all the source files in their own folder, for example, a folder called. C:\MyBook\source\. If you used Activ Quick Project, you should already have an empty folder created and ready to work in. Start Impress and open your saved Presentation. Click Export… on the File menu. You will want to save into the source folder, for example, C:\MyBook\source\. NOTE: When you do this, your presentation will actually be stored in several files in this folder. The main file of which will be index. Because there are a whole bunch of files for each presentation, it is best to always keep different projects separate from each other, by using a different source folder for each presentation that is being converted into an E-Book. One other thing of note, is that when you do Export in Impress 2.1, there are a lot of options about how the information is saved (we will go through these options in moment). To avoid having to re-enter these options each time, Impress 2.1 has a feature called designs. These are basically a saved set of the options, that specify how the program should save into HTML. We do not cover designs in this tutorial, but if you use Impress a lot, then you may want to learn about them later from the OpenOffice.org help or from a manual. The Export… menu will first display a dialog which allows you to select which folder you want export the presentation to, under what file name, and in which file format. Navigate to your source folder (for example C:\MyBook\source\), enter the file name as index, and set the File format to HTML Document (OpenOffice.org Impress) (.html) as shown below - then click Save. Impress will now display a "wizard" which guides you step-by-step through the export process. In this wizard, you should complete each screen, and then press Next>>. The first screen of the wizard allows you to pick an existing design (if you have one or more set up) or start a new layout. We do not cover designs in this tutorial, so select the New design radio button, then press Next>>. The next screen allows you to choose how to present your the presentation after conversion. You should select Standard HTML format as the Publication type, but you may check or uncheck Create title page and Show notes as you feel appropriate. When you are ready, press Next>>. The next screen allows you to choose to allows you to how you would like your presentation converted into HTML. You can choose whatever options you prefer. When you are ready, press Next>>. The next screen is only shown if you chose to Create a title page. If you did not chose to Create a title page, skip to the next step in this tutorial. You can fill out the text how you want. Then, when you are ready, press Next>>. The next screen allows you to select the type of navigation buttons to be added to your presentation. Choose whatever options you want, then, press Next>>. The final screen of the wizard allows you to choose the colors for your presentation. You can choose whatever options you want, then, allows you to select the type of navigation buttons to be added to your presentation. Choose whatever options you want, then, press Create to convert the presentation to HTML. You will be asked if you wish to save the Design (all the settings you just entered in the wizard). Since we are not covering Designs in this tutorial, for now you should just click Do Not Save. The conversion to HTML is now complete! Modify your presentation in the normal way using Impress. Save the changes in the OpenDocument Presentation (.odp) format. Repeat the above procedure for saving your presentation as HTML. Before doing this, it’s a good idea to either clear all the files out of your source folder (do not delete the original Presentation file! ), or save the Presentation as HTML in a brand new empty folder (in the latter case, you’ll also need to update the selected folder in Activ E-Book Compiler using Edit/Scan Folder…). This is so that you don’t get files left-over from the last iteration in 2nd, 3rd, 4th, etc., version of your E-Book. We’ve been preparing some tutorials on how to create eBooks using various pieces of software. One of the revelations has been just how easy it is to make eBooks using OpenOffice.org (which is a free office suite, although you can buy a copy of OpenOffice.org if you prefer). In my opinion, it’s easier to create eBooks using OpenOffice.org than it is us the far more expensive Microsoft Office . So without further ado, here a tutorial on creating an eBook using Writer - the word processor in the OpenOffice.org suite. Before the text, a quick legal notice, which OpenOffice.org’s marketing people said I should include: OpenOffice.org is a registered trade mark used with permission of the OpenOffice.org Community, http://www.openoffice.org. Anyway, here’s the tutorial for OpenOffice.org Writer - it’s equivalent to "Step 2" in the Getting Started section of the Activ E-Book Compiler Help. For the record, these instructions were prepared using OpenOffice.org version 2.1 - so it is possible if you have an older version, some details of the screens may differ. This page shows you how to create the the content that will go inside (the source files) your E-Book using OpenOffice.org Writer 2.1. Each document in OpenOffice.org Writer will be converted into 1 HTML file. Each HTML file becames one scrolling "page" in the E-Book (although if printed the HTML file may actually come out longer than one printed page). You will probably find it easiest to logically subdivide your work between HTML files, rather than trying to make each HTML file correspond to one printed page (which would probably virtually impossible anyway). For example, you could make each HTML file contain 1 chapter or section of your E-Book. It does not matter if some HTML files contain more text than others, because when the user views the E-Book, the scrollbars will appear and adjust automatically to the length of the page. Or to put it in other words, we recommend that you create separate documents (in Microsoft Word which are then converted to HTML) for each chapter or section of your E-Book. The conversion from a OpenOffice.org Writer document into an HTML file is done from within Writer (but don’t worry, we explain the steps below). As you will probably want more than 1 scrolling "page" in your E-Book, you will need to create a series of HTML files from OpenOffice.org Writer (in the example below we create 2 HTML files). You must save the main file (the first one that will be displayed when your E-Book opens) into HTML format, with the file name index into your source folder. OpenOffice.org Writer will automatically add .htm to the file name, thus giving index.htm (again don’t worry the instructions below show you what to do). You can save your other files with any name you like (although we recommend sticking to letters and numbers, and avoiding spaces and special characters), but again they must be saved in the source folder. If any of your Writer documents contains pictures, then provided you follow our instructions below, they will be saved automatically as separate files in the source folder. Writer 2.1 will do this completely automatically, provided of course you follow the procedures below. You can create hyperlinks between your HTML files, or from your HTML files to web sites (we show some examples of this below). Please be aware that OpenOffice.org Writer’s feature that converts from its own document format to HTML may have some limitations, so it is possible that you may lose some details of your formatting during the conversion process in Writer. If you have some information that absolutely can not be reformatted, the best idea is to create that information as a picture (e.g. in PNG format) using a graphics program and then insert the picture into your OpenOffice.org Writer docuent. We are not going to prepare some content for your E-Book. You should store all the source files in their own folder, for example, a folder called. C:\MyBook\source\. If you used Activ Quick Project, you should already have an empty folder created and ready to work in. Start OpenOffice.org Writer 2.1. settings you will be presented with a blank word processor document and be ready to start typing. Do not do enter anything yet. Now select HTML Document under New on the File menu. Before you start typing, let’s pick the file name, and save to HTML (the web page file format that you need to use for Activ E-Book source files). Click Save As… on the File menu. You will want to save this file as index (as it will become the main page of your E-Book) in the HTML Document format, into the source folder, for example, C:\MyBook\source\. Drop down the Save in dropdown combination box, and find the source folder (you may need to do this more than once if your source folder is a folder inside a folder). Click inside the File name text entry field, and type index. Do NOT press Return! Drop down the Save as type dropdown combination box. Make sure that HTML Document (.html) is selected - this item should in fact be already selected. Now start entering the text of the first page of your E-Book into Writer. When you are done with your first page, click Save on the File menu. Click HTML Document under New on the File menu. This will create a second HTML document. You will want to save this file under another file name as it will be a different page of your E-Book (do not use spaces in the file name), for example, as page2. Whatever name you pick, you need to save in the HTML Document format, into the source folder, for example, C:\MyBook\source\. Click inside the File name text entry field, and type page2 (or whatever name you want to use). Do NOT press Return! Now start entering the text of the second page of your E-Book into Writer. If you click the Window menu in Writer, at the bottom of this menu, you will see menu items to switch between the various documents that you have open. Next, we’ll create a hyperlink between the main page and the second page. This will allow a person to read the first half of our poem, and then click on a link to continue reading. Select the page you want to link from (for example index - it should be listed on the Window menu). At the bottom of the page, add some text that will eventually become the hyperlink. Select the text that you just added using the mouse. Also remember, that for links between files that will make up the pages of you your E-Book, both files must be located in the same folder. In the text field labelled Path, we should enter the file name of the page that the hyperlink will lead to. You may, if you wish, use the little folder icon to the right of the Path field to browse a file name (do not change folder if you do this), but if you do so, the Path field will display something like C:\MyBook\source\page2.html which is incorrect. You must then edit the path, to just contain the file name (in this example page.html), or otherwise you E-Book will not work correctly when compiled (because it would depend on specific folders and files on your own PC that your readers would not have). Click the Apply button to place the hyperlink, then click Close. The hyperlink has been made, and will show up as blue underlined text. To see the text clearly, you may wish to move the text insertion point using the mouse (and clicking elsewhere in the document) or by using the arrow keys on your keyboard. The hyperlink that we just added one page, leads to a different page within the E-Book. We will now learn how to add a hyperlink that goes to a web site. Select the page you want to link from (for example page2 - it should be listed on the Window menu). In the text field labelled Target, we should enter the URL of the web page or web site that the hyperlink will lead to. Always include the http:// at the beginning of the hyperlink. For example - even though we commonly say www.yahoo.com or just yahoo.com, the full URL is really http://www.yahoo.com - and we must always use the full URL when setting up hyperlinks. Click Apply thenClose on dialog, and you have added your hyperlink which will show up as blue underlined text. Before we finish, let’s see how to add an image to a page. Start your favorite graphics program, clip art program, your copy of CoverFactory, or if you have none of these, the Windows Paint accessory. Then use it to place a graphic of your choice, in JPEG, PNG or GIF format, in the source folder (the same folder as your HTML files), in this example, C:\MyBook\source\. If using Windows Paint, use Save As… on the File menu to do this - make sure you set Save as type to an appropriate format in the Save As dialog box. In most graphics programs, you also would use Save As… on the File menu to do this - make sure you set Save as type to an appropriate format in the Save As dialog box. In clip art programs, you would generally use an option called something like Save As or Export to do this - again make sure that you save/export in an appropriate format. 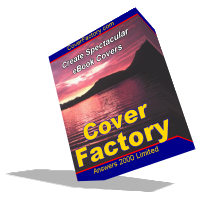 If using CoverFactory, you should use the Render To File… option on the Render menu to do this - CoverFactory will give you the option to render into JPEG, PNG or BMP format. We recomend that you choose PNG as this will produce the best quality results while retaining a small file size. Now switch back to the OpenOffice.org window contaiing the file in which you wish to insert your picture. Then move the insertion point to where you want to insert the picture - in my example, under the Yahoo! hyperlink (then hit Return a couple of times to add a couple of blank lines), then click From File… which you’ll find under Insert top level menu (note: you must use From File… and not File…). You have now finished writing the text of your first E-Book, so now you want to save your work and exit Writer. Click Exit on the File menu. Writer will ask you: Do you want to save the changes made to each file (Save, Discard or Cancel) - select Save. You will be asked these questions for each file in your E-Book: just remember to always say Yes when asked if you want to save, and Yes HTML is a satisfactory format. Eventually, Writer will close itself, and you are now ready to compile an E-Book from the pages that you have created. CBRocket is our PHP script that lets your web site visitors to search ClickBank without leaving their site. And set up targeted text ads. And all the links to the various ClickBank products, in both cases, are tagged with your clickbank affiliate ID, allowing you to earn commissions on sales. A customer wrote to me recently with a limitation that has just arisen (because of recent changes at ClickBank’s site), and my testing has now confirmed it. When you log-in and ask CBRocket to retrieve the latest Clickbank marketplace data, CBRocket seems to only be retrieving the first 100 listings from each subcategory (subcategories are things like “Marketing -> Promotion”). This sounds like perhaps CBRocket may be leaving out a significant chunk of the ClickBank marketplace - but as always with computers - things are never quite as simple as they first seem. When I just tried CBRocket on the marketplace, it did retrieve 5729 unique items, plus a further 1916 duplicates. I don’t yet know the number that should have been retrieved, but it does not sound like a vast number of items have gone missing. Many subcategories contain less than 100 items - items in these subcategories won’t be affected at all. For those subcategories which contain over 100 items, items 101 onwards are often duplicated in other subcategories which do contain less than 100 items. So, these types of items also won’t be "lost" either. By "lost", I mean that CBRocket is not retrieving these items from the ClickBank marketplace to its database, and hence these items won’t be displayed in ads or search results (although of course other items would be). At this exact moment, I can’t say that no items are being "lost", but neither can I yet say that any items are actually being "lost". I simply don’t know yet - although my gut tells me that the chances are, a few items are being "lost". Anyway, I’ve examined the problem, and it should be fairly straightforward to fix. We expect to have an update to CBRocket within a week or so. Check here for updates, and don’t be afraid to email us if you have any questions. I’ve done some more testing. It does seem a fair number of lower ranked items are affected - I guess the ClickBank marketplace had grown even faster than I realized. According to my data, there are now 8365 unique items in the marketplace, plus a further 3641 duplicates - which means that 2636 lower ranked items are currently not being retrieved. This would correspond to items which rank below 100 in all the subcategories in which they are listed. Anyway, the good news, is the planned fix appears to work fine - so we should hopefully (fingers crossed) being able to release a fix within 1 week, and perhaps a bit sooner.